Last Christmas, Tyler Lang accidentally accepted David Griffith’s invitation for dinner. Yes, it was an accident. See, hipster (don’t call him that!) Tyler doesn’t date guys, and even if he did, he certainly doesn’t date jocks. A rude and hasty exit right when the date was getting good left things awkward between them. David Griffith isn’t really a jock. Well, he’s a former athlete who loves sports, but “jock” has a certain connotation that doesn’t quite fit the intelligent, hardworking store owner. A jock wouldn’t have given Tyler Lang the time of day. But even after that little, ahem, stunt with the fire escape, David can’t stop thinking about the hipster a year later. Which would be fine if fate didn’t keep butting her nose into their business, making it impossible for the jock and the hipster to avoid each other this Christmas. A hilarious holiday romp, set to the music of the Winter Sounds. Okay, fine. If he couldn’t get out of this with direct and sound logic, he would try the irrational. The completely, totally—did he say completely?—irrational. Tyler tightened his grip on David’s hand, leaned forward, and kissed him. But before a full second had passed, David burst out laughing against Tyler’s lips. Tyler yanked back, heat suffusing his face. “Because I….” Don’t know what in the hell I’m doing. It was probably the first time in his life he really could say that. He’d learned things before. There had been a time when he hadn’t known how to knit, when he hadn’t known how to make gourmet chocolates, when he hadn’t known how to use a soldering iron—but those were just learning opportunities. But with this? He felt like he was standing out naked on the corner with only mistletoe to cover his bits. The second kiss was what Tyler would have called sweet if the word had been in his vocabulary. David’s lips were warm, soft, giving, and for a moment the kiss lingered on that edge of innocent, like a snowflake dancing through the sky. Then the world tipped and Tyler’s hands were in David’s hair and David was drawing him closer and, motherfuckinggod, they were kissing. Hard, searching lips, taking and giving, and it took him way too long to realize what he was doing. In fact, he might not have ever realized it if they hadn’t needed to breathe like humans do. It took a long moment for rational thought to come back to Tyler. 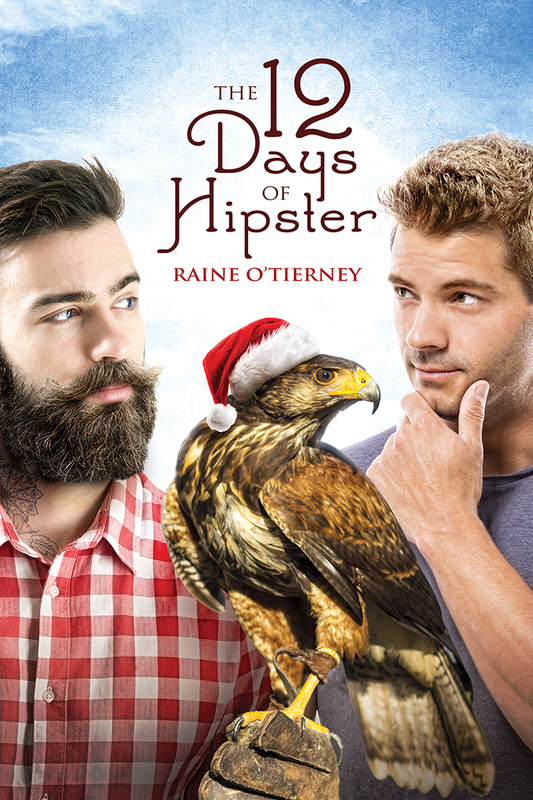 I friggin’ love the cover of my new book, The 12 Days of Hipster. Paul Richmond designed it, so of course you know it’s good! If you’ve seen the cover of the first book-- Bowl Full of Cherries-- you’ll remember his gorgeous, hand-drawn art. This time we decided to try a photo-based cover and I’ll tell ya the truth… I was a doubter. How in the world were they going to get a peregrine falcon with a Santa hat to look halfway decent? Also...why did I request a peregrine falcon with a Santa hat? I, and my main character, Tyler Lang, are very much impressed with the result. What are some of your favorite Christmas covers?? Called "Queen of the Sweetness" (well, two or three people said it anyway!) Raine O'Tierney loves writing sweet stories about first loves, first times, fidelity, forever-endings and...friskiness? Raine in Kansas City with her husband, fellow Dreamspinner Press author, Siôn O'Tierney. When she's not writing, she's either asleep, or fighting the good fight for intellectual freedom at her library day job. Raine believes the best thing we can do in life is be kind to one another, and she enjoys encouraging fellow writers! Raine changes sub-genres to suit her mood and believes all good stories end sweetly. Contact her if you're interested in talking about point-and-click adventure games or about which dachshunds are the best kinds of dachshunds!